It’s been so busy recently, I haven’t had the time to post about all the amazing things we’re doing! The posts will come, I promise. Still, I wanted to spend a few minutes sharing some homestead things I love right now. 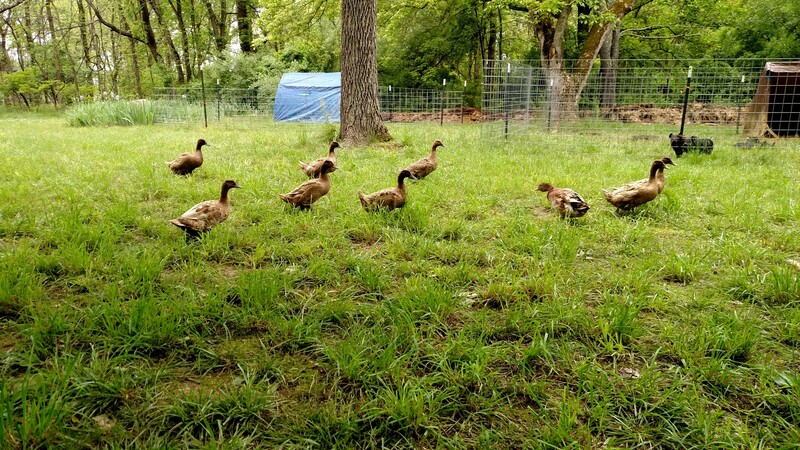 If I could go back in time, I would have made roll out nesting boxes for our chickens and ducks. Here are a few examples (1, 2, 3). Imagine the time I would have saved by not having to wash eggs! Plus, we are currently dealing with an egg eating problem in our duck flock, and roll-out nesting boxes would have likely prevented the issue. Now we’ve added “create roll-out nesting boxes” to our never-ending to do list. So those of you just designing your coop or duck house. Make roll-out nesting boxes. You’ll thank me later. As I was sprinkling DE in the coop today, I was thinking about how awesome it is. We use it for all kinds of pest control! Put on the ground of livestock pens, it helps with fly control. Having an issue with flies on goats? We put DE on their brush, and then brush their coats. They like that, and they hate when we use fly spray. Plus the DE will help kill any mites or lice! There’s a really awesome blog post series about home dairying, but it exists only in my head at the moment. This fall, I’m thinking I’ll get those posts up! Until then, let me share how happy we’ve been with our Simple Pulse Milking Machine. This machine has made my milking quicker and easier. My milking time has decreased by about 25%. 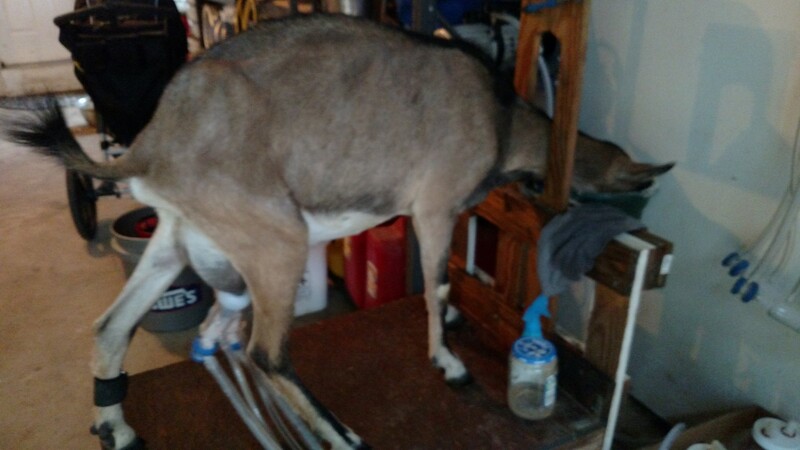 We have 3 goats, and the efficiencies of the milking machine would be even greater for a larger herd. We have the best farm dog. Whiskey is a Catahoula mix, and she is amazing! 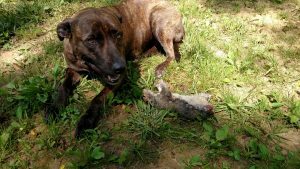 Learn more about Catahoulas here. In short, it says Catahoulas are amazing farm dogs, and everyone with a farm should have one ;-). Whiskey’s a rescue, yet she is a wonderful livestock guardian dog. You don’t need a purebred Maremma or Pyrenees to do the job. Here’s an article I wrote previously, in which I sing Whiskey’s praises. I want to adopt all those adorable Catahoulas! This past Saturday we processed a batch of 26 Freedom Rangers. We LOVE this breed of meat chickens. They free ranged amazingly, they were healthy and sturdy, and they looked so tasty when we processed them! I can’t wait to roast up a chicken this week. We bought the chicks from the Freedom Ranger Hatchery. We love this hatchery! We’ve always found the quality of the chicks is very high, and the loss rates are very low. Plus the birds ship from Pennsylvania, which means they get to us in Virginia in just a day. This is faster than the midwest hatcheries. I imagine you’re crazy busy this summer, too, so thanks for taking a few minutes to read about what I love right now! Hopefully this article will give you some awesome ideas for improving your own homestead. Stay tuned for more posts about milking, meat chickens, and how we’re solving our egg eater problem! Now, go rescue a Catahoula and fall in love with one of the sweetest farm dogs you’ll ever know.